Dermarolling / Microneedling / Why vitamin D2 instead of D3? I just ordered your kit and feel that your site is very professional and thorough. I do have a question: why are you using synthetic vitamin D2 instead of D3. I only take D3 internally due to all of the articles I have read about the efficacy of D3 over D2. Thank you. My take on it: There is no hard evidence that D3 is better than D2. D2 has worked very well in the past and as soon as we find anything better or are advised of such (you're more than welcome to offer suggestions), we'll switch to it. Yes. But you can also apply vit. C in the morning and vit. A in the evening or apply vit. C and the day after apply vit.A. If your Obagi contains tretinoin or retinoic acid or retinol or retinyl palmitate or retinyl acetate then you are already having vit. A in your Obagi. The most important element for disinfection is the roller. Wash it with warm water and dishwashing liquid and dip it in alcohol after each use (pour some alcohol into a cup and submerge the roller in it). Air dry and keep it in a closed container until the next rolling. Discard the alcohol you dipped it in. You only have to disinfect the rolling environs (such as a desk) if you are using it, when rolling, to place the roller there, or if you touch that area your hand and then using the same hand to stretch the skin to be rolled, for example. If your skin is thick and doesn’t stay red hours after rolling, then you can roll three times a week. 3. Apply Regular Skin Care. If your Obagi contains vit A then add only vit. C to your routine (twice or three times a week). Wash your face, dry the skin, use vit. C, wait at least 15 minutes for it to penetrate - then use Obagi. If your Obagi doesn’t contain vit. A, then get a cream with vit. A or use Obagi with vit.A. Infadolan is excellent after rolling to protect and regenerate the skin and supply it with vit. A but it is not suitable to be put daily on the acne-prone parts of the facey because it is not a cream, it is an ointment (you can use it daily on other parts of body, it is very good to protect the back of the hands, rough elbows, the soles of the feet etc). Just remember that ascorbic acid (vit. C) cannot penetrate through oils and fats so it should be applied on bare skin and only after that you apply your creams. It is possible but not recommended. Be careful! I have just started to use a physical exfoliant with hydrolyzed silica as the scrub agents. I plan to wait again 2-3 days before resuming, or should I wait for a full week just to be on the safe side because I don't want to exacerbate the skin condition? Dermarolling speeds up skin turnover, there is no reason to exfoliate soon after dermarolling. You should exfoliate very much prior to dermarolling. That is useful. It will make needle penetration easier. If I were to use a chemical exfoliant such as a BHA or AHA, are the circumstances the same or different than that of the scrub? Yes it is the same. Both methods exfoliate the skin. If the percentage of AHA or BHA is very low (as it is the case with ordinary skin creams) then you can use it. Again, strong acid peels should be used prior to dermarolling, not soon afterwards. It also depends how old you are. Young skin has a high skin turnover - it doesn’t need to be exfoliated very often. Old skin or acne prone skin should be exfoliated more often. Say I buy both the 1.5-mm and 0.25-mm dermarollers and decides to use them both in my skin care regimen. I have read a lot of your threads and posts, but I don’t think my specific question was answered for me: So I use my 1.5-mm on a Friday, then how many days should I wait until it is OK for me to use the 0.25-mm for product penetrations? When the redness is gone and the skin has healed. Just to confirm, using the 0.25-mm (not immediately after) will or will not interfere with the collagen production caused by the 1.5-mm? A 0.25 mm long needle doesn’t reach the dermis and it doesn’t trigger collagen production. Nevertheless - don’t overdo it. The more is not always the better. I have read somewhere that the conversion from Collagen III to Collagen I takes months to complete. I do not understand the benefit and logic of rolling even 5-6 weeks after the first session. You said in one of your post that at least the first stages of collagen production is complete, but pricking the skin with a 1.5-mm again will cause trauma to the same area, again, so wouldn’t it destroy the collagen III “in progress” that have finish just the first few stages? Wound healing has several phases: Hemostasis + inflammation, then proliferation/reconstruction and finally maturation/remodeling. In the maturation stage, the collagen is replaced by a stronger form of collagen and its pattern is rearranged, the wound continues to contract. The formation of new collagen is not localized to the exact area of the pricks. It's a consequence of a complex would healing cascade. And the pricks channels have zero diameter, weeks after a rolling session. So the chance of hitting those exact same spots is very low, in spite of the fact that you have quite a high needling density. I have to say that there is at least one professional microneedling practitioner that disagrees with having such long breaks. She claims that the collagen formation process works differently than is described in professional literature. See, this is a complex subject, even for professionals. I have a fresh tube of tretinoin I rather not waste, how many days after using the 1.5-mm is it OK to apply tretinoin? 2-3 days? One week? When the skin has healed. How about hydroquinone? L-ascorbic acid? I know you said you can apply vitamin C before, but you never give an exact number of days before you can resume acids such as these. Vit. C should be OK to apply 24-48 hours after rolling. Make sure you apply it before rolling. Hydroquinone: If a high percentage is used excessively for a long time it can cause exogenous ochronosis (a bluish-black pigmentation of the skin) which is more or less irreversible. If I can tolerate the acids with mild to no redness, then it is still OK to use Tretinoin and vitamin C after rolling? Yes, I am also referring to IMMEDIATELY afterwards. And on top of that, some cheap Vaseline in a tube as my occlusive for the holes in the skin. I once put 0.025% Tretinoin on my face just after rolling with a 0.20 mm roller and it took 3 hours for the burning to subside..
How long should I be avoiding anti-inflammatory ingredients after using 1.5-mm?2-3 days? One week? I will be using 0.25-mm to give better penetrations to ingredients like these and acids, hydroquinone, and niacinamides. Last question here (for now): in your instruction manual, you give advice on Vitamin C serum, I still have questions: If I don’t have a 100ml bottle, is there is formula you can give me to make the percentage of vitamin C I want to the size of bottle I have? Say I have a clean 270ml toner bottle from an old product I cleaned with alcohol and washed with hot water, how many teaspoon of vitamin C powder should I add to make 10% vitamin C? 20%? You weren’t clear about percentage in your manual. It should be about 10% vit. C but not everybody can handle this because 10% is bit sticky. In that case make it weaker. 19 parts of water and 1 part of vit. C powder makes roughly 5% vit C solution. I have clogged pores, will I make my pores and the clogged ones in a worse state if I rolled on that area? Rolling should actually unclog the pores because it speeds up the skin turnover. I know that other sites encourage you to roll more often, but we think that their advice is based on medical ignorance or commercial motivations (they'll sell three times more rollers that way, as they blunt three times faster). Rolling more often can be compared to bodybuilding the same muscles every few days. Instead of growing, the muscle will damage more and more, as it gets no time to repair the micro-damage done to it. EDIT: If you are male with a thicker skin, you can roll three times a week with 0.5 mm. It also depends on where you roll. The skin on a man's back and buttocks is very thick. No, you can not sterilize anything with warm water alone. You would be seriously grossed out if you would be able to see the result under a microscope! You would at least need a detergent to get rid of the skin oils. The recommended way is to put the roller in alcohol, as explained in our instructions. Some people put them in the dishwasher, but we can't guarantee that the roller won't damage or blunt. Our manufacturer claims it's no problem. Those cleaning tabs may blunt the needles. Those tabs are made to clean plastic, not metal. The tip of a needle is only a few molecules thick, so blunting can happen with acidic or alcalic chemicals, especially when using hot water. Betadine is a powerful alternative or additional sterilizing agent - better than alcohol, however it may stain the roller. This is harmless but ugly. You can also use it on your skin before rolling, but to wipe it off before rolling. Do not use Betadine if pregnant or breastfeeding. Many forget that how you store the roller is at least as important as how you sterilize the roller. I've seen someone keeping the roller in its box but without the lid, on top of her washing machine. Next to the washing machine was the toilet. I've read somewhere that every time you go for a #2 and flush, that many invisibly small water droplets are sprayed out. If they land on the roller - especially when you leave it for a month, there, you can get nasty surprises. Treat the roller with the respect it deserves - it's a medical instrument. When in doubt, discard it. I mean, if you drop it in the toilet bowl or onto your dog, do not try to sterilize it. There are limits. The best disinfectant for skin is Betadine liquid or cream (containing Povidone-iodine). Wash the Betadine off with tap water before you roll and don’t forget to clean your hands with soap before you touch your face. Betadine is for sale in Pharmacies as well as online. You can also use Chlorhexidine (around 2%). If rolling 4 times vertically, horizonatally, and diagonally give 250 pricks per cm2. Then rolling 10 to 20 times in each vertically, horizontally, and diagonally would give me more than 1000 pricks per cm2 and much better collagen placement. Do you think it's okay to roll that much? The thing is that for ideal, quick regeneration there should always be plenty of undamaged skin in between the holes. Laser rejuvenation techniques where the entire top layer of skin was evaporated are gradually being replaced by fractional lasers where only tiny fractions of skin are removed because it highly speeds up the regeneration and it reduces the risk of infection. Fraxel treatments usually have to be repeated to get the desired result. Fractional lasers use the same principle as a dermaroller. A dermaroller makes holes mechanically. Fraxel makes holes thermically, evaporating small skin areas. The depth and diameter of the hole and their density can usually be set up and those parameters are comparable to those recommended with dermarolling. I am not sure what the maximum density a fractional laser can be set up for. I think that 1000 holes per cm2 is too much. More intact skin should be left for regeneration - being the main factor in skin improvement. You can perhaps roll densely locally on an area of skin where you have acne scars or the like. I do not have experience with such dense rolling. The recommendations of surgeons using dermarolling are about 200-250 holes per cm2. I recommend using dense needling – needle abrasion (with a single needle) on specific skin conditions - on stretch marks and surgical scars to crush the hardened collagen. Use less-dense needling for wrinkles and acne scars. Both methods are successfully used against acne scarring. TCA cross is especially successful with ice pick scars. A dermaroller doesn’t easily get into ice pick scars. You can also improve an ice pick scar with a single needle. Dermarolling / Microneedling / Copper peptides? It's a bit too early to be able to give a definitive answer about that (the list of ingredients is long), but I assume no. It is a water-based cream. Yes. We already paid for them in fact and they will be sent to us approx. on April 13. So we should be able to offer them around the end of April, beginning of May if all goes well. They come in 30-gram tubes and we will sell them for 9 USD. Apart from copper peptides (0.2% GHK-Cu) they will have nano-Platinum and some other products in them. The reason we will be able to sell them so cheaply is that we let them be produced in a factory for us and we ordered an enormous quantity (for us at least). >wait to roll for the first time ? Wait at least one month if you use needles longer than 0.5 mm. Sculptra is injected into the deep dermis or subcutaneous layer. A dermaroller with 1.5 mm long needles doesn’t reach that deep but ask your doctor approximately how deep the Sculptra is injected. A 1.5 mm dermaroller penetrates about 1.3 mm into the skin. If they inject Sculptra to a shallower depth than 1.3 mm then do not use a 1.5 mm dermaroller at all. The principle behind dermarolling is to renew the skin by causing mild skin damage. Our body repairs that damage and thus the skin gets renewed/remodeled. A dermaroller mechanically makes tiny holes into the skin and that damages some skin cells. Our immune system immediately starts removing those damaged skin cells, which are replaced by new cells. My concern is that if you roll as deep as Sculptra has been deposited, those tiny wounds will be cleaned up by white blood cells and Sculptra might be partially removed as well as a side effect. That means that your Sculptra longevity would be affected. If the Sculptra has been injected deeper than your dermaroller can reach, then there is no problem and you can use it. In any case - if you roll over an area with Sculptra underneath, do not push a long-needled roller in too much. But it also depends where you roll. Skin thickness is not the same all over the body. The thickest skin is on the soles of the feet, palms of the hands and on the back. If you for ex. roll the stretchmarks on your back with a 1 mm roller, you'll hardly notice it. If you rolled your upper eyelid with the same roller (but the upper eyelid area must NOT be rolled! ), you would hit your eye because the skin is very thin there. I just want to explain you that it is difficult to give ideal general recommendations on rolling frequency or needle length. There is not enough data to be certain about the optimal interval between dermarolling sessions for various needle lengths and various skin problems. We prefer to stay on the safe side with our recommendations. No damage can be done by rolling less frequently and rolling a few days sooner or some days later is not going to make much of a difference in your results. That is also the principle behind most laser rejuvenation treatments. Laser either evaporates the entire top layer of the skin or it evaporates only fractions of the skin (Fraxel laser). A dermaroller makes tiny holes mechanically, whilst a fractional laser makes tiny holes thermically. But in principle it is the same. The holes made by a fractional laser are not deeper than that of a long-needled dermaroller. I have never heard a "Fraxel" surgeon recommending the procedure to be performed daily or weekly or even bi-weekly. The treatments are usually spaced out weeks apart and the patients will be informed that collagen production will continue many months after treatment. Another way how to cause damage to the skin is acid peels. Contrary to a dermaroller, acid peels remove the entire top layer or layers of the skin so it is not the same. Nevertheless, nobody recommends doing acid peels very frequently, especially not the deep ones. Cause damage – let it completely heal and regenerate – wait – cause damage – let it completely heal and regenerate – wait – cause damage, etc. In the link to Dr. Fernandes you posted in the other thread, Dr. Fernandes disagrees with Dr. McCaffery because he says that the minimum interval for 1 mm rollers is one week. This implies that the minimum interval for 0.75 mm needles must be at least more than a couple of days. So Dr. Des Fernandes and Dr. Phillipa McCaffery are in disagreement. It gets even more interesting: The patent holder of the Original Dermaroller™ disagrees with both Dr. Fernandes and Dr. McCaffery, because the patent holders advise very much longer treatment intervals. The Original Dermaroller™ patent holders say that a 0.2 mm roller can only be used two to three times a week. So they would strongly advise against Dr. McCaffery's practice. We were aware of all this conflicting advice, and based on that conflicting advice and what we learned from the most recent published studies, we came to advise what we do at the moment. And not even comparing their "before and after" pictures will help - they all have those and they all look impressive.. I want to add that it is not in our financial interest to advise a long pause between rolling sessions - we would sell several times more rollers (they would blunt faster) if people would roll with much shorter intervals. So our advice is based on literature research - not commercial motives. They say that a minimum of six weeks interval is required. It is not clear what needle size they're talking about (The longest needle length roller they manufacture is 1.5 mm and the longest needle length they sell to private individuals is 0.2 mm), but they manufacture a wide variety of sizes and their smallest permissible interval to roll with long needles is 6 weeks. So there is no concensus amongst experts. I read the PDF you linked to, and there the recommended interval with a 1 mm roller is "minimum one week and maximum one month". Firstly, the "maximum one month" seems arbitrarily chosen and is certainly not based on any objective scientific criterium because evidence exists that skin remodeling takes longer than that. Also, the optimum treatment pause depends on such factors as the patient's age and the skin thickness rolled, as well as how vigorously is rolled. We therefore read the available professional literature and expert opinions on this subject and came with a general recommendation of two weeks pause for a 1 mm roller. Incidentally, this ties in nicely with the PDF concerning a 1 mm roller quoted by you: "Micro-needling can be undertaken at an interval between one week and a maximum of one month". The most beneficial for skin regeneration is the longest pause. The riskiest is the shorter pause. Nobody knows yet what the best interval is, because these studies take a long time and many patients and additional factors are at play as well. Last but not least - professionals such as plastic surgeons have a commercial interest: They need to "bind" the customer to them. If they tell a customer to come back six weeks later (because that would be the best for their skin in the long run), the customer would think: "This doctor is too slow - I'll find one that gives me faster results". I am sceptical of any advice in a hyper-commercial advertising folder that is not backed up by scientific arguments, regardless how well-known its author is. In that same PDF ad they mention 3 mm needling as an option and their method as an alternative. 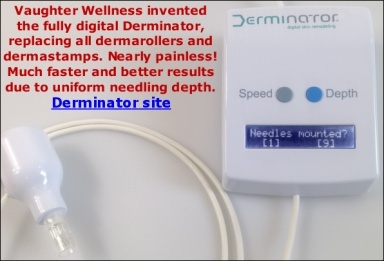 But the patent holders of the Dermaroller say on their site that 3 mm rolling is total nonsense, that those needles are much too long. Again, the choice for 3 mm needles may just be a commercial one: The customer will think, when the doctor uses 1.5 mm needles: "I can do that at home twenty five times times cheaper". But when the patient gets a bloody face under strong anesthesia, she thinks: "Wow - that must be the most effective treatment possible".